Dumfries & Galloway already has over 380MW of generating capacity from operational on-shore wind farms (www.renewableuk.com) which is enough to supply the annual electrical energy consumption of over 180,000 homes, or 2.6 times the number of households in our region (Housing Information Briefing Note Number 1: Estimates of Household Dwellings in D&G, 2012). 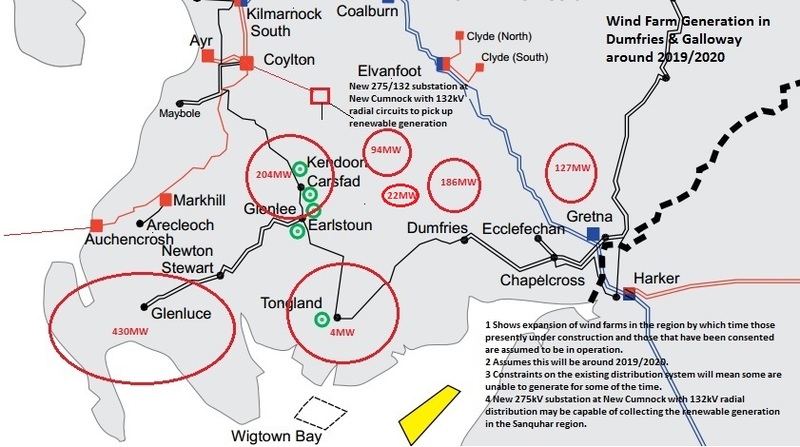 The implication of drawing a line in the sand for public subsidy means that by the time those on-shore wind farms that are presently under construction and those that received planning consent by the 18 June 2015 are all operational, say by 2020, the amount of on-shore wind generation within Dumfries & Galloway will increase to about 1080MW. That’s around half of what might have been expected had the public subsidy not been withdrawn early. The diagram below indicates what the situation could look like by the end of this decade. What this shows are the areas within red circles where on-shore wind generation occurs while the figure within the circle indicates the amount of generation. So over the next 5 years or so we can expect a significant build-up of on-shore generation around Glenluce (from 75MW today to 430MW) and Kendoon (from 40MW to 204MW). There is also a modest increase around the Sanquhar area. The East of the region can also expect to see an increase (from 47MW to 127MW). The point, however, is that this increase is nowhere near what it might have been without the recent government announcement. The requirements for connecting wind generation have therefore fallen significantly and the generation build-up, from where it is today, will mainly occur in the West of the region in two locations. This change of intent, which we can assume was unexpected, has an impact on the proposed scope of the Strategic Reinforcement Project as it currently stands both in scale and cost. Strategic Reinforcement Project: It’s time for a re-think!